Special from Speed51.com – Corbin, Kentucky’s Josh Brock was leading both the ARCA/CRA Super Series and JEGS/CRA All-Stars Tour points standings in 2017 before he received news nobody wants to hear. He was diagnosed with Non-Hodgkin’s Lymphoma and was forced to step out of the driver’s seat to receive treatment. On January 1, Brock was told he was cancer-free and was received clearance from his doctor to return to racing. 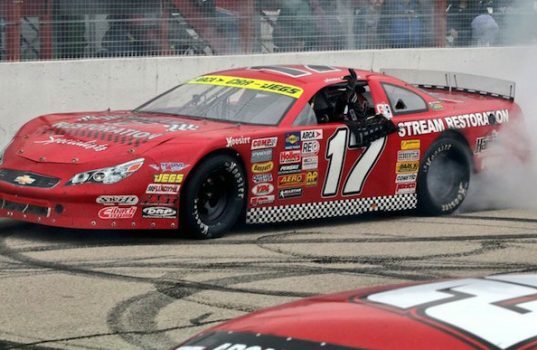 He followed that exciting news with his first-career ARCA/CRA Super Series win at Anderson Speedway (IN) in May. And on Sunday afternoon, he completed his comeback season by winning the ARCA/CRA Super Series championship after finishing eighth in his first Winchester 400 attempt. Brock’s championship triumph was celebrated with a burnout on the front stretch and hugs from his family and crew as he tried to hold back tears. For Brock and crew, it was the culmination of a moment he was unsure if he was going to experience. As for the future, Brock plans on racing in the All-American 400 at Fairgrounds Speedway Nashville and on the dirt over the winter before defending his ARCA/CRA Super Series championship in 2019. But for right now, he is a champion. And through the ups and downs, one quote from his win at Anderson describes everything leading up to his ARCA/CRA Super Series championship.